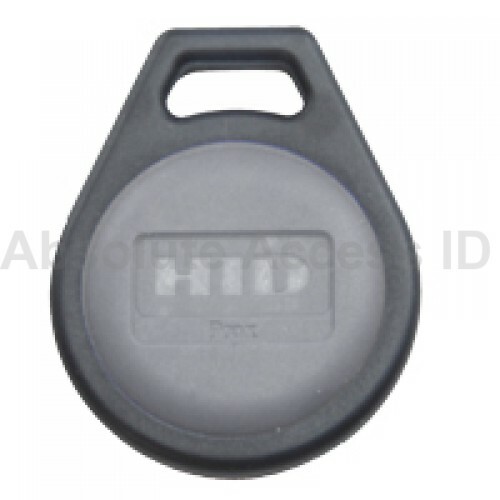 The HID 1346 ProxKey III is a proximity keyfob offering access control in a small and convenient, pocket size device. The HID 1346 key fob can be easily attached to a key ring, badge clip or lanyard. Additionally, the 1346 ProxKey III by HID is extremely durable and built to withstand harsh operating environments or handling. The HID 1346 ProxKey III is ideal for use in access control applications where a Photo ID is not required. 1. 26 Bit H10301 Card Format: Requires a facility code and start card number which customer specifies upon ordering. 2. 37 Bit H10302 Card Format: Does not require a facility and card start number upon ordering. HID controls the card numbers for this format thereby preventing any duplicate card numbers. 3. 40 Bit C10106 Card Format: These cards are sequential in number when placing a single order however, you will not be able to have sequential card numbers throughout your system. HID assigns the card numbers to this format therefore preventing duplicate card numbers. This 40 Bit card format is compatible with Casi Rusco systems. Please specify your format requirements at checkout. Pricing on the HID 1346 key fobs includes customized programming to your specifications. Lead time is approximately 5-7 days with custom programming. Free Ground Shipping on standard orders. If expedited shipping is needed, please contact our office and we will gladly provide you with a cost estimate for expedited shipping through UPS or FedEx.